Aditi's Pen: October's here with some Cheer! October's here with some Cheer! Can you smell the winter in the air? The sweet October air, cool and crisp, whispers in my ear, making my heart flutter. I wonder if it's because of the drift in the air or the love? Well, my body is the first to caution me of the season change. I've dealt with my share of sneeze and cough the past week and am stepping into this new month, with my heart brimming with love and gratitude. Say October and I'll say love...it was this month nine years ago when a casual "We're more than just friends" remark in the football field had caught me off guard and let him score the goal and also score in my life. Our relationship blossomed into a blissful companionship and as fate would have it, it was in October 2011, that we officially embarked on the journey of Man and Wife. I am extremely grateful for having him in my life. He has loved me for me. Without questions, without expectations, he has always been there for me. And though we have the most extremely contrasting personalities, we have our disagreements, our fights with the dramatic "you don't understand me", at the end of the day both of us know that there is no one better capable of understanding and loving us the way we do. We are meant to be. I'm also grateful for the weather that October brings. Not too cold and the sun mellow, perfect for a vacation, don't you think? We are always seen packing our bags in this month. 2011 was the exotic Mauritius, 2012 we were romancing the beautiful valleys of Kashmir and this year we are road tripping to the vibrant Rajasthan. Super excited to add road trip to our book of firsts! We are leaving tomorrow, what a start to the month! And it only gets better from there. My dahlin sis is coming on 14th....after exactly 4 months! Sistaaar, missed you terribly!! Can't wait...lot's of catching up to do over coffee n cakes! :) I share more of a protective mother/ possessive boyfriend kind of bond with my sister. God knows why?? After all we're only a year and a half apart. It bugs me that she is more comfortable sharing about her crush with Ma instead of me. Can't blame her though... I do tend to get all preachy with her....just can't help it! I also want to say Thank you to the very simple things in life, which we tend to overlook or take for granted. Like the morning cup of tea and browsing through the newspaper. Mornings seem incomplete somehow without this ritual. Like right now, I'm grateful for the electricity, the Wifi and my laptop. Things that make us comfortable, we should be grateful for them too, no? As we embark upon this month, take a moment and say thank you to a thing....what would it be? And yes, I'm grateful for October!! happy anniversary month to you!!! enjoy your favorite time of year! Thanks Kathy! Beautiful Autumn isn't it? Have a great month! Wow, October...I find this month excellent as well...almost for the same reasons as yours. Good luck with your Rajasthan trip...hope you guys have loads of fun. Enjoy! OOOohhh Awesome, congratulations to both of you, Aditi.. Loved the way it all turned out.. wishing you many more such happy years. Happy anniversary!! And you guys seem to have a cute love story behind the marriage, wont you let us know :) Have an amazing trip, come back refreshed and tell us how it all went! Love and luck! And I guess I am the same with my sis as you are with yours...that protective mother/possessive boyfriend types hahaha! Thanks!! :) I'm back and already craving for another trip!! :-) How lovely to see your comment, Ms.Amita. What a blessing! 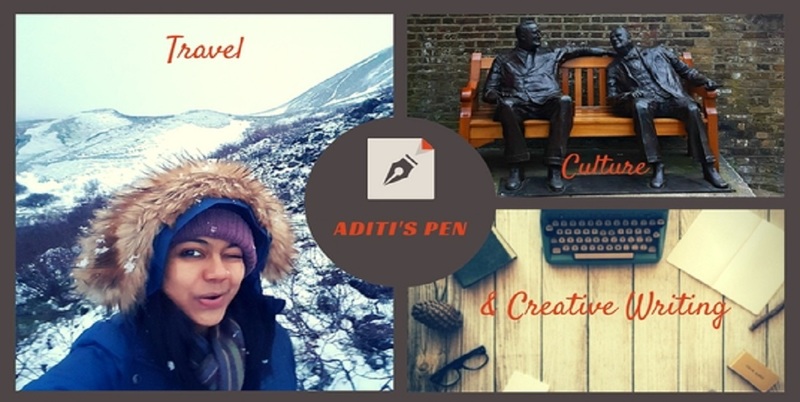 What a sweet post, Aditi. Have a fab road trip and come back and write about it. Happy Anniversary. How special! Thanks a lot Vidya :) will surely do!! Very happy anniversary to you! Have a safe and memorable trip! Thank you so much Indrani! I'm back from an amazing trip and will share the delights soon! Thanks a lot! Had a fab trip...will post about it soon! Thanks! Really behind on posting the trip report :( being lazy :( will surely get to it this week! Aww!! I am in love with this month too! !